I've signed up to audit two on-line classes at Nashville State, our local community college. 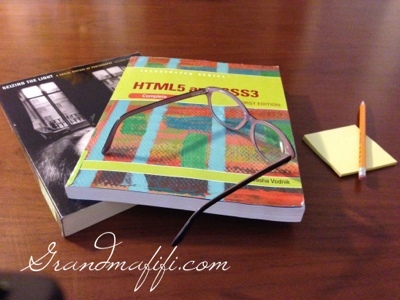 One is about HTML, which I believe will help me edit my blog. Or not. I suppose I shouldn't admit I don't really know how it works. The second is History of Photography. I was going to take a more hands-on Photography class, but the student was required to have a Digital Single Lens Reflex (DSLR) Camera. After research, I'm not sure I need DSLR. I'm hoping that the History of Photography class sensitizes me to issues such as lighting and focus. The text books were almost $200 used (class is free because I'm of a certain age). Even with competition from the Internet, college bookstores still maintain ridiculous prices; but I surrendered and purchased them anyway. The bookstore offered to rent the books, but that would make me nervous all semester. If they survive, I might be able to sell them back. I can not remember the last time I spent so much time standing in lines: a line to register, a line at the bursar's office (even though the classes are free), a line for student IDs, a line at the bookstore. The mother and daughter in front of me at the bookstore used a check, and the clerk had to call the bank and make sure it was OK. I remember when it was the credit card users holding up the line with validation calls. I'm looking forward to the classes. Bob encourages me with various blog related activities, but he must wonder at the time and expense. I tell him that it's a great retirement hobby, and much cheaper than a boat. Please include photo of boat. I am not quite sure about the history of photography class. You certainly need a hands on approach to photography. There are wonderful cameras out there that do the job, and think of all the wonderful photos of your grandchildren you can take. Thank you for your comment! Do you have a suggestion of what kind of camera might be best? I use a Fuji FINEPIX HS 25exr It has a 30x manual zoom. It is a fine camera. Of course, you can spend a lot of money on cameras, but this does a nice job. There goes my book deal. People don't really like pharmacists. Oh, no! How did this happen?